Don’t blame me for that team name. When the idea of an escape room world championship came up a long time ago, I was pretty dismissive. If teams played different rooms, there would be no comparison. If teams played the same room with different hosts, then you likely wouldn’t be able to compare them. Even if teams played the same game with the same host, then, as soon as they asked for clues, I don’t think the finish time would be comparable. Would you give clues at a predefined interval? Would you wait for them to ask for clues? If one team took an extra twenty minutes in a game but one fewer clue, are they better or worse? 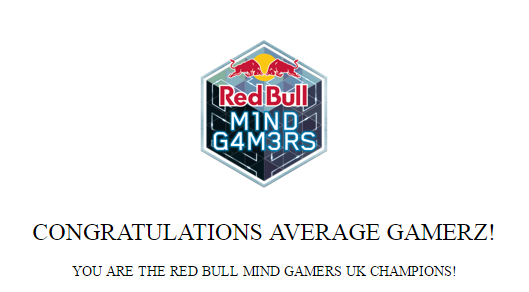 When Red Bull came along with the Mind Gamers promotion, I was equally dismissive. Don’t get me wrong – I would still have taken part, but I had serious reservations. The format of the event didn’t fill me with confidence either – we’d start off by qualifying online via a computer game that didn’t appear very escape-game-related. Then, if we were lucky enough to grab one of the qualification spots, we’d head to one of the physical qualifiers and play another variation of the computer game as a team of (exactly) four. If we were the fastest team in the country, then we’d get to travel to Budapest for the final, where we’d actually be playing a real escape game. The problem was that the only UK options were Cardiff and Manchester on weekdays. Assuming I could even qualify, that would mean a day off work and a seven-hour round trip to play a twenty-minute computer game. That was a hard enough sell to myself, but convincing three of my friends to come along for the ride was never going to be a possibility. Even the prospect of a trip to Budapest wasn’t likely to swing it – this was pretty much a lottery, as far as I could see. It wasn’t a game that played to our strengths, early teams might tell later teams how the game worked to give them an advantage, some teams might be genuinely very good and, even if none of those was the case, we’d still rely on making fewer mistakes than any other team in order to qualify. That was a huge investment that seemed unlikely to pay off. So, that was it. I played the online qualifier, got a good enough time to qualify and then got on with my life. I was sad about not taking part but it just wasn’t worth all the hassle that entering would entail. And then I got a message from a fellow enthusiast who’d managed to form a team of three players and was still looking for a fourth. Who was going up to Manchester and organising to play a bunch of escape rooms at the same time. Who was even willing to totally rearrange their plans to give me the chance to play as many escape rooms as possible with that day off work. I still wasn’t convinced, but when I “casually” mentioned the idea to Mrs Logic, she gave me unexpected approval, so I packed my bags and headed up. I sincerely doubt any other combination of players outside my usual team could have convinced me to go up, but all three of my new team mates had got qualification times for Manchester, all three were experienced escapers and all three were people I had met and got on well with. From my point of view, this was the Dream Team – we had a genuine shot at qualifying in Manchester and wouldn’t embarrass ourselves in the unlikely event we made it to the next round. Having come on board just a couple of days before the event and with a bunch of commitments over the weekend, I didn’t really get the chance to replay the qualification game until first thing on the day. Oh dear. It turned out that, in the intervening few weeks, I’d lost any ability I’d previously had. Cue a subtle message to my team mates suggesting they also have a few practice goes and twenty minutes of playing myself until it was time to leave. On arrival at Breakout Manchester, who were hosting the event, we were greeted by the Red Bull staff and asked to sign their disclaimer. Most enthusiasts have had to sign a few disclaimers in their time, so this came as no surprise, but the content was a bit different from usual. They reserved the right to record our sporting statistics… such as air time. We could be asked to wear a GoPro-type camera and could only refuse if it might interfere with our sporting endeavours or if we had sporting contracts that specifically forbade it. We had to have personal liability insurance… OK, so maybe it was a generic Red Bull sporting disclaimer, but I like to think they’d come up with it specifically for this event and we really would have our jumps timed. Finally, the moment was upon us and we got to enter the room and choose our screens. We stood in a square, each facing inwards towards a personal 40+ inch touchscreen. While we had our own stations, we were allowed to jump between screens and help each other if we wanted. As well as the four of us, there was a game controller, a photographer and a videographer (or maybe even two). I’d like to say they were distracting or slowed us down, but in truth I barely noticed them during the game itself, in spite of jumping between stations on several occasions. The games started off with really easy stuff, just like online. Nice easy taster levels to start with – the first three levels were trivial with one screen in use at a time, rotating round the players. Then it started involving a couple of screens, then three and, by stage 7 and only 90 seconds into the game, all four of our screens were in use and I was starting to really enjoy the game. We were shouting across the room to our team mates to let them know what was happening, jumping between screens to help out if someone got a bit stuck. Moving, swiping at the screen, concentrating. This is how multiplayer team games should be: competitive and cooperative. Make no mistake – I wanted to finish my level before my team mates but then I immediately switched to wanting to help them finish their screens too. Not long after we went fully four-player, they started throwing in variations of the game that weren’t present on the online event. We started to realise why certain elements of the online experience worked the way they did. In most stages, one screen was the primary . The primary terminal was guaranteed to finish last and the other players were trying to unblock that screen to allow its player to continue. Certain areas of that primary screen would be locked with a symbol indicating how to unlock them. The secondary screens needed to connect power to those locked symbols but, with up to three separate symbols on each secondary screen, the primary screen player would need to communicate the right symbols to the other players as quickly as possible. Mostly it was plain sailing but on two levels we hit total roadblocks. One in particular really cost us. It was the hardest level in the game (the penultimate one), and we fortunately had our best player on the primary screen. We’d taken a little longer to get her unblocked, but as we moved the board around, we got ourselves into a bad state. I remember saying “trash the board” (to suggest we deliberately fail and restart her screen) but we faffed for thirty seconds longer unsuccessfully trying to fix it. I thought we’d totally blown it at that point but, when we eventually restarted, the player took total control and, in a scene worthy of the Matrix , swiped like a maniac to clear a path across the board and complete the level. One easy level later, it was all over and we looked at the time to find it was just over twelve minutes. The game had seemed to last an eternity but at the same time flash past in a moment and, as we walked out of the door, I reflected on just how much I’d enjoyed it. I didn’t regret having made the journey up to play the game even though I was pretty certain that we’d failed. I’d done my research beforehand and, while twelve minutes would have won around two thirds of city-level competitions, I also knew that it wouldn’t have won the country crown in many places. We waited outside, chatting about it for around half an hour. Our captain went off for an interview with the Red Bull TV crew, we had photos taken and we discussed our experiences and how well we felt we’d done. Secretly, I was waiting to see how the next team would get on although, it transpired I wasn’t the only one with that thought, and eventually the next group reappeared. We’d remarked that they looked good when they’d walked in, but they failed to even complete the game. It was easy to forget just how good a team we’d put together and just how impressive our performance was – when you look across the winning teams from various cities, those teams were probably the ones that hadn’t just been good but had also had a good performance. 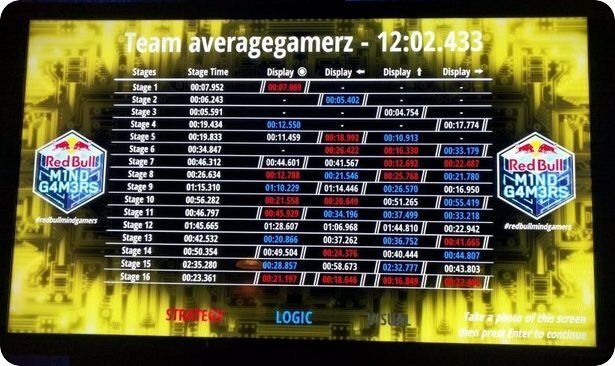 In spite of the fact that we felt we’d screwed up two of the boards quite badly, wasting 90 seconds or more, we’d still had a time that would have topped the leaderboards across two thirds of cities. When I said this was the Dream Team, I really wasn’t kidding: all four of us had been in the top 25 qualifiers, none of us had used the pause button online to achieve that, all of us could solve puzzles on the fly, work well under pressure, communicate with team mates and, critically, could take charge or back off depending on what our team mates needed. Wait. Solve puzzles on the fly, work well under pressure, communicate, take charge, back off. The more I reflected on the experience, the more I felt that someone had actually done a really impressive job of making an escape game qualifier. Don’t get me wrong – this qualification process massively favoured people who liked logic-based computer games and people who were willing to spend long periods practising the game, but it still played to the strengths of escape room players. It was almost as if someone had written down a list of things that were tested by escape rooms and then a second person had taken that list and tried to create an online version of that without knowing where the list had come from. Any realistic escape room test would have been massively vulnerable to information leaks and, with a two-month competition period and a prize of a trip to Budapest, that would almost certainly have happened. This game was still somewhat vulnerable to that issue but nowhere near as much as it might have been. With the game over, we headed out of the venue and on with our escape room trip. Over the next few days, I was desperate to discuss it with some of the other international enthusiasts who were involved but not wanting to give them an unfair advantage. It was incredibly frustrating because I wanted to talk about all the ways in which it was good but doing so would inevitably have told them too much about how the game worked. I don’t know what the final will bring, but I know that I’m excited to be going. I’ll be playing an escape game designed by Scott Nicholson, professor of game design and development at Wilfrid Laurier University and probably the world’s leading academic in the escape game field (with help from his students Robert Durant, Sean Harrison, and Chris Tenuta). I’ll be going back to Budapest for several days courtesy of Red Bull. I’ll get to play in a global escape room tournament. More than anything else, though, I’ll get to do all that with three of the best people I’ve met through getting into escape rooms. This really is a privilege.